2015 Porsche Cayenne revealed | What Car? The current Porsche Cayenne was introduced in 2010 and this its first face-lift. A range of relatively subtle exterior improvements have smartened things up front and rear, but the majority of the improvements have concerned the engines. The revised line-up consists of four conventionally powered models but the biggest news is the introduction of a plug-in hybrid model. This replaces the previous non-plug-in hybrid model and uses technology first seen in Porsche’s Panamera E-Hybrid. The biggest news is the replacement of the hybrid model with a plug-in hybrid. This has a three-litre V6 petrol engine and an electric motor with a combined power output of 428bhp. The maximum range on pure electric running is 22 miles and the maximum speed is 77mph. Combined fuel economy is a claimed 83mpg and with emissions of 79g/km, it is a tempting company car prospect with a benefit-in-kind tax rate of 11%. 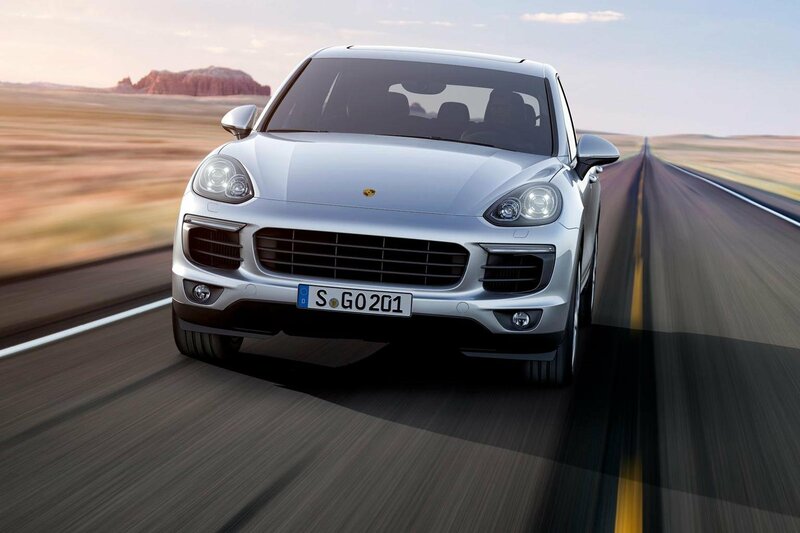 The Cayenne S gets a new V6 biturbo engine that improves fuel economy and emissions over the previous generation’s V8 and reduces the time taken to sprint from 0-60 mph by around half-a-second. Its official economy figure is 29.7mpg. The 4.8-litre Turbo version gets 520bhp and will cover the 0-60mph dash in 4.5 seconds. It'll also do an average of 25.2mpg. The standard Diesel model is tweaked for improved emissions and economy, so it'll now do an average of 42.8mpg and emits 179g/km of CO2. The V8 Diesel S is similarly tweaked, with a drop to 209g/km and a slight economy improvement to 35mpg. All Cayenne models now get xenon headlights and LED daytime running lights as standard, with the range-topping Turbo getting dynamic LED headlights. Front and rear parking sensors, cruise control, an automatic tailgate and start / stop technology are standard across the range. Turbo models also get self-levelling active suspension, Bluetooth connectivity, sat-nav and a Bose surround sound audio system. A new design of steering wheel and gearshift paddles are standard on all models, while the rear seats are redesigned for improved comfort. Seat ventilation is now an option. The cheapest route into a Porsche Cayenne is the standard Diesel, which costs £49,902. Prices then leap to £60,218 for the petrol-powered Cayenne S and £61,474 for the Diesel S and the S E-Hybrid. The range-topping Cayenne Turbo costs £93,763. No model of Cayenne is a volume seller so you're unlikely to get a discount. The main rivals to the Cayenne come are the Range Rover Sport and the BMW X5. The Range Rover Sport is a What Car? award winner and available with seven-seats, but neither rival is available as a plug-in hybrid so the Cayenne now has a significant advantage in company car terms. For people who lust after the Porsche badge, the smaller Macan now offers a cheaper route into sporty SUV ownership.